Q. Please tell us a little about yourselves. Are you a couple? Where do you live? A. We have been going out for over a year and are a couple – boyfriend and girlfriend. Right now we are traveling the world and exploring Central America. Beforehand we were both living in Bristol. Oscar – I am English, born in France and lived in Bristol for a couple of years. In my younger years golf was a major part of my life and something which I took very seriously. A number of events took place and my interests changed where I enjoyed my time training (in the gym), learning more about myself and discovering what I enjoyed doing in life. I am now a golf coach and a Personal Trainer where I taught in Bristol. As well as this I love doing Shintaido, this is a wonderful practice to intertwine with golf, fitness, and my daily life. In the UK both my instructors were Nagako Cooper and Masashi Minagawa. I have been doing Shintaido for a year. And now I’m traveling around the world working with children and encouraging them to experience this new and exciting body movement! My website is oscarsharpe.com where you can learn a little more about me. Q. How did you get started teaching Shintaido to children? The setting is clearly a school. Are one or both of you teachers at the school? A. Oscar was introduced to Shintaido through Stephanie in the beginning of 2017. Nagako has been my instructor and Masashi has been my Master where I have been having sessions with both of them since. Stephanie has been working in schools for over 10 years and founded Let it Sound for children in 2016 including Shintaido and sounds. 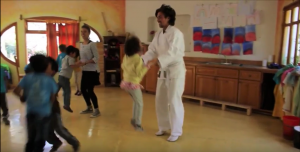 The Waldorf Steiner School called ‘La Escuela Caracol’ in Guatemala accepted to have us for four weeks to run our program of Shintaido and sounds: in parallel teaching English classes and Personal training by Oscar. We were doing this together and separately to primary school children and adults. Q. Did you encounter any difficulties teaching Shintaido to children? If so, what were they? A. This is something completely new for children, as a result they can get really excited or quite shy. As you can imagine this can be challenging at times. However this is a great learning for the children and us. Q. Do you think any of your young students will keep up with the practice? A. It will be challenging for children to keep up a Shintaido practice because they don’t have someone there for support. However there were a number of exercises which were memorable due to the amount of fun they had. We feel very confident that this will remain in their memory for a long time. Q. How, if at all, did the children relate to some of the larger philosophical concepts behind the movements of Shintaido? Did you even bring them up, or did you just let the kids enjoy the freedom of the movements? A. Before we start the movements we explain what they mean and the energy behind the practice. Stephanie has rearranged some of the exercises adapted for the children – this is done in a fun, light and meaningful manner. We show the movements to the children supporting them along the way, but also feel it’s important that we take a step back so they can learn and explore themselves. Q. Do you ever come to the United States? What are your plans for yourselves for the future? Are you both on the path to becoming Shintaido instructors? A. We are not sure what the future will bring. Right now we are in Costa Rica and living each week as it comes. We intend to go to Columbia in a few months time and gradually make our way south. As for The States, if there is an invitation why not? In the past we were both thinking of becoming Shintaido instructors, however with the journey we are on this is on hold. Q. I see that Stephanie has posted other videos with the children in them. Is film-making your profession? Enjoy the Children are the Future video!